I’m on a brief break from gel nails and have been doing a bit of ‘DIY’ nail painting -which makes it sound way fancier than it is. That’s a long winded way of saying I painted my own nails… which I did and decided to go all old-school blogger and snap some photos of ‘the claw’ to show the colour off. 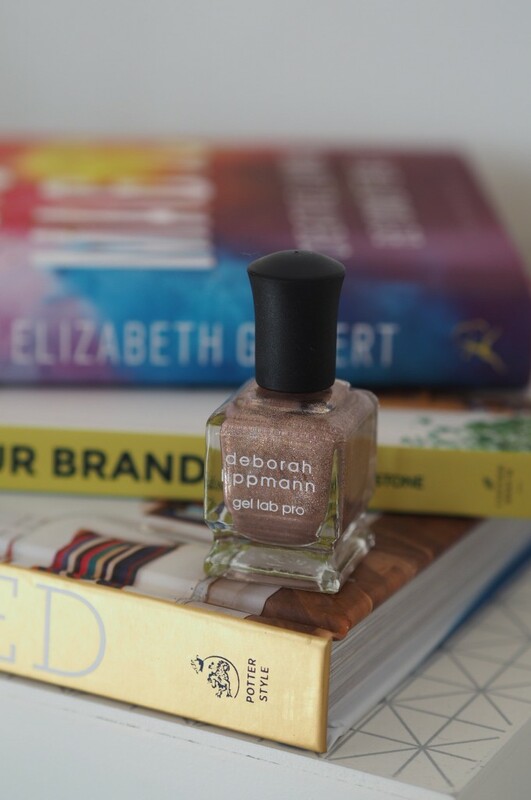 It’s a pretty rose gold shimmer shade – Deborah Lippmann Stargasm – a colour I think is a tad tricky to nail in polish form. It’s either too rose or too gold, too cream or too shimmer. It’s also a bit of a pain to capture a photo of that really accurately captures the shade because it does that thing where it looks different in different lights. In some it’s pure rose gold, others it’s more bronze or gold. I did take the actual claw shot but I’m pretty self concious about my hands so decided to just flash a nail that (hopefully) gives you a little peek at what it’s like in action. Just a speedy little product post highlighting what it actually looks like in action. Application wise, I used a Nails Inc base coat, two coats of Deborah Lippmann Stargasm then a top coat of my trusty Seche Vite (forever the best top coat in my opinion). It lasted fairly well – with a few chips around the tip of my nails after around 4 days. I could have ‘gotten away’ with it for a couple more days I recon but as I’m embracing the DIY side of beauty life I decided to switch things up and change for ‘Flawless’ by Essie – a bit of a girly pink cream that is very out of my ‘ordinary’ choices but one I am liking. But if you want a shimmer-packed rose gold shade then Deborah Lippmann Stargasm is an ace choice! I’ve never tried anything from this brand but gosh that’s a lovely shade, nice and neutral. This looks lovely! I love a shimmery nail polish! Beekeyper – Latest: Beauty Pie Superstrobing Drops – gimmick or gimme? Love this shade of polish! Will be perfect for my wedding – thanks for sharing!